Benalla is a regional city on the Melbourne to Sydney Highway, 180 km north-east of Melbourne. Since the completion of the Hume Freeway, Benalla can be bypassed by motorists. It is between Euroa and Wangaratta. When pastoral overlanders followed reports by explorers Hume, Hovell and Mitchell of the Port Phillip grazing lands, they had to cross the Broken River. Alexander Mollison found a narrow stream bed and built a temporary bridge to transport stock and equipment (1837). He ‘broke through’ the swampy river, and it thereafter became Broken River. Mollison's route became an accepted means of access. It was marked out with some care for the purposes of an overland mail service between Melbourne and Sydney (Joseph Hawdon, 1838), and for policing of the district. An Aboriginal massacre of several members of George Faithfull's pastoral run (1838) near Benalla provoked official attention to the district. Benalla was fortuitously placed on the Sydney Road which led to several north-east gold fields. It also received traffic to and from Shepparton (today's Midland Highway). The surrounding land was suitable for wheat growing, orchards and vines, as well as grazing. By 1863 Benalla had two National schools and a Catholic school, Methodist, Anglican and Catholic churches, a mechanics' institute and five hotels. The Black Swan Hotel included the Cobb and Co coach office. In 1873 the railway line through Benalla to Wodonga was opened, and ten years later the branch line from Benalla to Yarrawonga was opened. 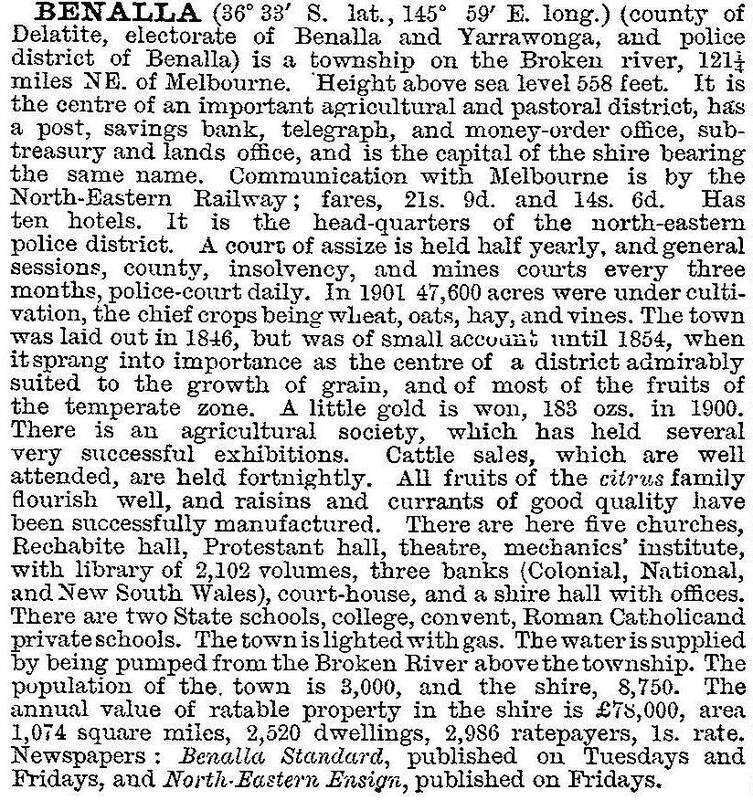 The Benalla Shire was proclaimed 23 August 1869. The Benalla agricultural and pastoral society was formed in 1878. Benalla on the Melbourne side of the river was the main township, and has been known as Benalla West. The first primary school, Benalla West (1851) continues to function, and a secondary college (formerly a technical school, 1962) is next to it. Several churches, a convent and school, the Friendly Societies Recreation Reserve, the Agricultural Society's show ground and the Botanic Garden are in Benalla West. The placement of the railway station on the other side of Broken River, however, drew Benalla's commercial activity to that area. The Benalla East primary school opened in 1880. In 1941 an air training school was opened at Benalla East, and during the postwar years the former air training site became a migrant holding camp and a Housing Commission estate. Benalla has succeeded in attracting secondary and tertiary industries. Early examples were the State Electricity Commission's regional office (1924) and a clothing factory (1945). Textile and garment making became a major employer (323 employees, 1981), along with electrical transformers, food and beverages, and timber products. Regional government offices were built in 1960. Benalla's postwar urban growth was acknowledged by the shire's central riding being formed as a separate borough on 1 September 1948, the forerunner of the city proclaimed on 26 May 1965. Another indicator of postwar change was the closure of an 18 kilometre branch railway line to Tatong in 1947. A facility to produce ammunition, mainly for the Australian defence forces, is sited in rural surroundings north of the Benalla township and began production in 1993. One of the striking aspects for motorists entering Benalla from the Melbourne direction is the rose gardens beside the highway, a short distance before crossing Lake Benalla (1974) and the nearby regional art gallery (1975). The lake, formed by a weir across the Broken River, is adjoined by extensive parklands and recreation facilities. Other recreation facilities include two golf clubs and the State Gliding Centre at the aerodrome. Benalla City had 26,000 square metres of retail floor space in 1991-92, compared with 2000 square metres in Benalla Shire. Most of the city's retail space is in shopping strips in Benalla East. The rose gardens, the annual Rose Festival (1967) and the gallery have added tourism to Benalla's local economy, with the further benefit of proximity to the north-east and Goulburn regions and to eastern alpine snow fields. The gallery holds the Ledger collection of Australian paintings. Outer urban Benalla has the racecourse, golf course, saleyards and aerodrome. The showground is right in the town, on the main road opposite the art gallery. Benalla Shire (1869) originally included the Euroa district, extending south-west to Longwood. Euroa Shire was severed in 1879 and other minor severances occurred between then and 1906. 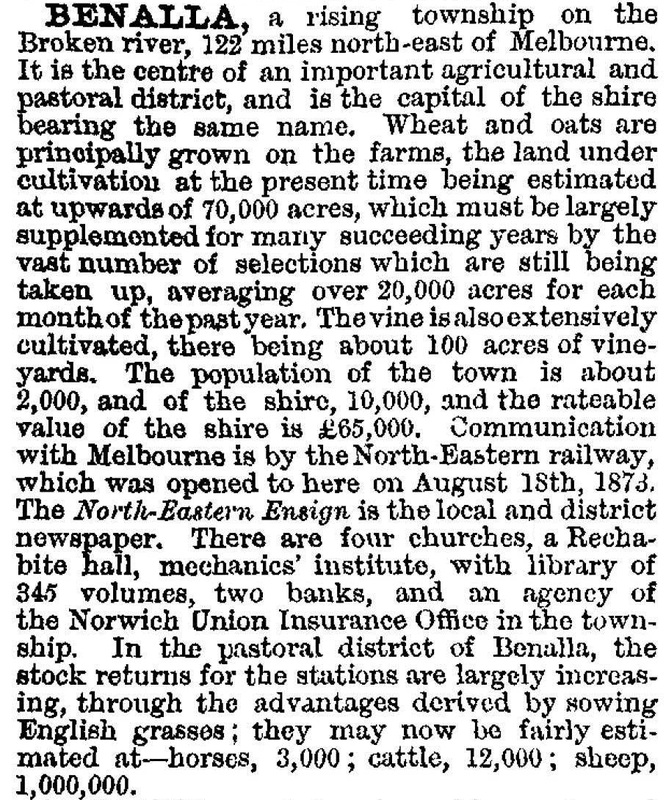 The shire's main agricultural output was sheep and lambs (286,000 head, 1994) followed by meat cattle (41,000 head, 1994) and small quantities of dairy cattle and cereals (8000 hectares). On 18 November 1994, Benalla City and Shire, Mansfield Shire and part of Violet Town Shire were united to form Delatite Shire. In 2002 Delatite Shire was divided into Benalla Rural City and Mansfield Shire. The Rural City (2354 square kilometres) extends from beyond Thoona in the north nearly to Tolmie in the south, about 70 kilometres. Its main transport corridors are the Hume Freeway/Melbourne-Wodonga railway and the Midland Highway (Mansfield-Benalla-Shepparton).